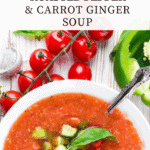 A healing, simple and hearty roasted red pepper soup with carrots and ginger. Perfect for days where you want to get your veggies in, but in the warmest way possible. Coming to you today with another soup creation. I know, I over-index on soups, but there’s a good reason. They’re super healthy, always warm and comforting on a cold December day, and there a great way to naturally “detox” from all those holiday party foods you’re probably indulging in right now. Want another great reason to over-index on soup? It heals a stressed out, overwhelmed vibe. Stressed? Have a bowl of soup. Do you ever find that even if you love eating salads, the idea of eating them in cold weather is completely unappealing? According to Ayurvedic principles, you shouldn’t have raw veggies in winter unless you live in a warm climate and particularly if you’re a stressed-out vata (<-hello, 100% me). If that sounds like you, I’ve got you covered. Cooked veggies and healthy fats are the perfect Ayurvedic combo for soothing a flustered and scattered mind and a dry, achy body. Better yet, this healing food combination is also incredibly delicious and a perfect meal prep idea for weekday lunches (or dinners). Whether you’re low carb, vegan or paleo, the simple ingredients of this soup will win you over. It’s incredibly healthy, simple to make and a total crowd pleaser. 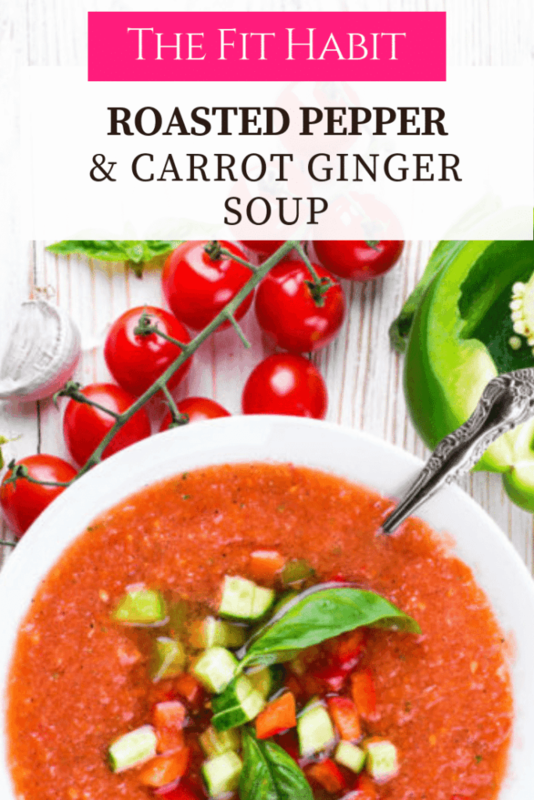 Looking for more healing soup recipes? You might also enjoy these ideas, all of which are paleo, low-carb and vegetarian or vegan-friendly. A warm, tasty soup that's great for fall lunches. Super easy and really cheap to make. Preheat oven (or toaster oven) to 425. Cut the red pepper in half, remove seeds and place halves directly on the oven rack. Roast for 10 to15 minutes until soft and slightly brown. Sautee the chopped onion in a little soup stock for a few minutes until soft, then add chopped carrot, the remaining soup stock, and the bay leaf. Cover, bring to a boil and then simmer for about 20 minutes until the carrots are soft. Once the pepper is roasted, remove from the oven, set to cool, then chop into 1-inch pieces. Add pepper to the simmering soup and remove soup from heat. Remove bay leaf and add coconut milk and fresh basil. Using an immersion blender, puree soup until the desired level of creaminess while adding in lime juice, vinegar, and seasoning to taste.